Content of all kinds is going digital, and that includes Reloading manuals. 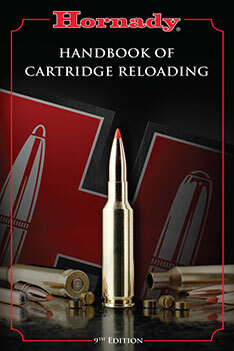 Now Hornady is offering an eBook version of the Hornady Handbook of Cartridge Reloading (9th Edition). Priced at $18.99, the eBook version of the Hornady Reloading Manual is now available for iOS (Apple) devices, for Android devices, and for Kindle eReaders. Hornady’s latest Handbook of Cartridge Reloading features over 900 pages of information, including much new data for the 9th Edition. For many cartridge types, load recipes for new propellants such as Power Pro Varmint, AR-Comp, and CFE-223 have been added in the 9th Edition. Cartridge additions include the 17 Hornet, .327 Federal, .356 Winchester, .416 Barrett and .505 Gibbs. You’ll also find expanded data on over 20 favorite cartridges including: .223 Rem, 300 Whisper/AAC Blackout, .308 Win, .25-06, .257 Wby Mag, and many more. And of course the load recipes provide cover popular Hornady bullets V-MAX, SST, InterBond, InterLock, A-MAX, XTP, NTX and more. Each cartridge write-up features applicable Hornady bullets along with velocity/powder charts for quick and easy reference. In addition to the comprehensive reloading charts, this reference manual provides helpful explanations of internal, external and terminal ballistics. To learn more about the eBook versions of Hornady’s latest Reloading manual, visit iTunes or Amazon.com. eBook Tip from EdLongrange. We welcome reader submissions. Share the post "Hornady Now Offers eBook Edition of Reloading Handbook"
Tried downloading the eBook version of Hornady’s 9th edition. Did not work. Also, you must make certain you have the correct operating system on your devices or it won’t work. I downloaded to my computer and it showed almost 2,000 pages. Knew that wasn’t right. Tried opening it and it won’t open in iTunes nor on my Ipod. Be cautious. I just had a refund from apple through Itunes store, book looked great but only lasted a few moments, wish I could get it in a download to burn to disc.